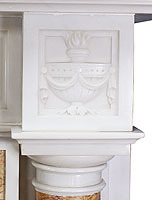 The Spelling Manor's Living-Room Fireplace Mantel. 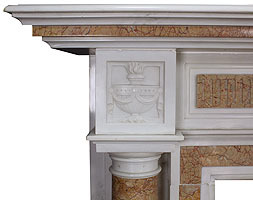 A Fine English Neo-Classical and Georgian Style Carved Statuary and Spanish Brocatelle Marble Fireplace Mantel, surmounted by a pair of columns, urn carvings and centered with a detailed carved marble vase with a bumble-bee, swags, scrolls and acanthus. Circa: 1900. 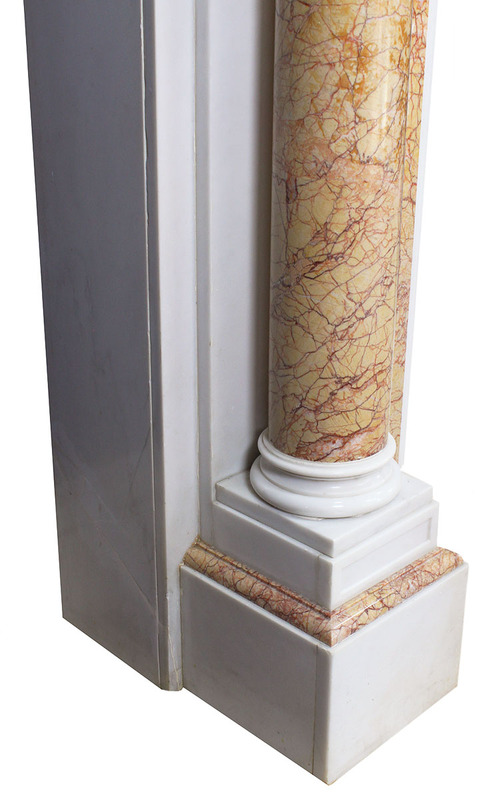 Provenance: The Spelling Manor - Los Angeles, California. The luxurious 57,000 square foot sprawling estate in the exclusive Holmby Hills neighborhood is the largest private residence in Los Angeles, even larger than the White House, and was catalogued as most expensive home in the United States. The French Château style residence which sits on 4.7 acres was built in 1990 by the late legendary TV producer Aaron Spelling for his wife Candy. 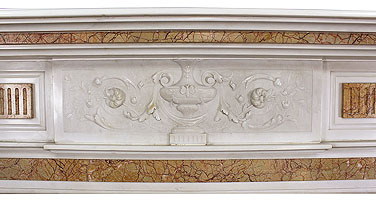 A Fine English Neo-Classical and Georgian Style Carved Statuary and Spanish Brocatelle Marble Fireplace Mantel, surmounted by a pair of columns, urn carvings and centered with a detailed carved marble vase with a bumble-bee, swags, scrolls and acanthus. Circa: 1900. 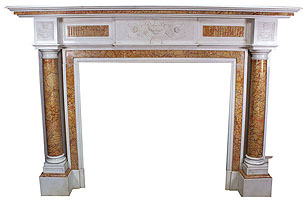 Jan's & Company Fine French Antiques, Inc. is proud to announce the acquisition of the Antique French chandeliers, antique mantels and wall lights from the residence formerly known as the Spelling Manor, now the Petra Ecclestone Residence. The luxurious 57,000 square foot sprawling estate in the exclusive Holmby Hills neighborhood is the largest private residence in Los Angeles, even larger than the White House, and was catalogued as most expensive home in the United States. The French Château style residence which sits on 4.7 acres was built in 1990 by the late legendary TV producer Aaron Spelling for his wife Candy. 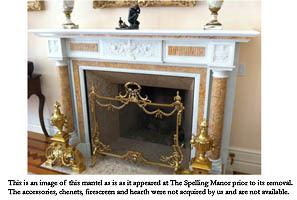 In a 2008 CBS News interview at The Manor, Mrs. Spelling talks about all the antique chandeliers and fireplace mantels which the Spelling's had acquired in Europe. In another video, Mrs. Spelling tours her home and talks about the acquired items.